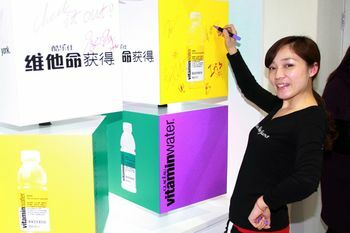 Coca-Cola wanted to open their second pop-up store in Beijing to promote the newly launched Glaceau Vitamin Water product. The objective was to build a new event space that would become the center of fashion and art activities in the city and serve as an iconic experience center to engage consumers with the product and brand. GPJ designed a space called “The Beijing Box”. In order to meet the client’s desire to integrate historical significance into the modern store design, GPJ took inspiration from the historical square courtyard houses in Beijing. The “boxed” theme was carried throughout all design aspects. 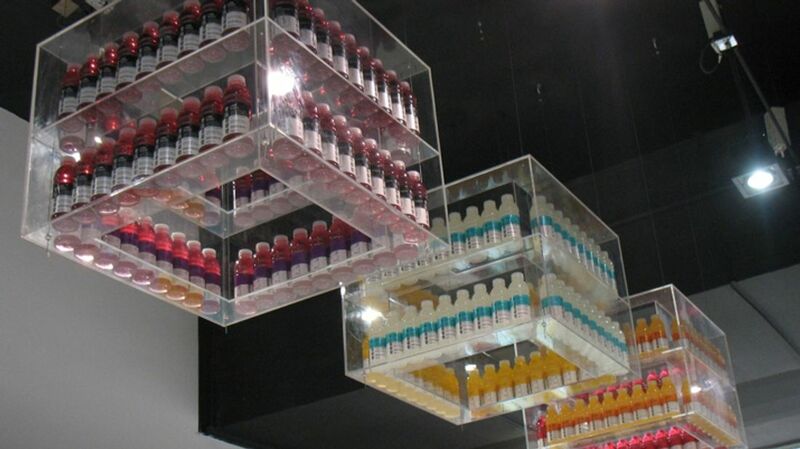 The “accessories storage wall” displayed fashion-forward items and branded images in a checker board-like arrangement. A large tilted box, resembling the rubik’s cube, served as an eye-catching sign outside the store entrance. 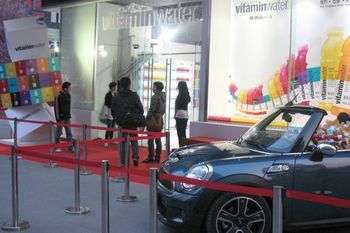 Before entering the store, visitors were met with a rainbow of 3 dimensional signage representing the Vitamin Water brand. This vibrant, checkered signage was offset by stark white store walls and floors. Cultural performers were positioned throughout the environment, dressed in masquerade-like costumes. Layering the stark white floors & walls with bright rainbow-colored checkerboard-like signage evoked a modern, stylistic vibe throughout the space. Lighting was an important element in creating the fashion-forward atmosphere. Alternating hues of bright green, orange, blue, red, yellow and purple illuminated the hallways. Since the Vitamin Water product comes in a variety of colors, they served as vibrant display elements throughout the store. Visitors could interact with various displays throughout, including a taste-test station. Masquerade-inspired performers greeted visitors as they explored the environment. Alternating hues of bright green, orange, blue, red, yellow and purple illuminated the space. Further inside, chairs, colorful signage and coordinated lighting surrounded a large white stage. 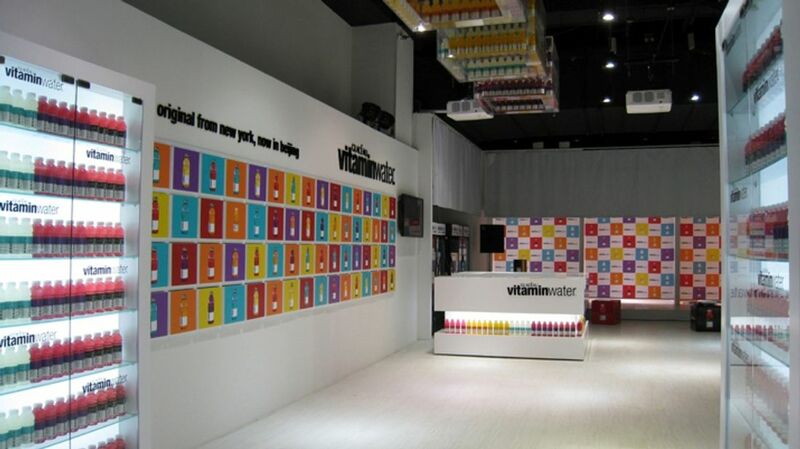 Here, guests listened to various Vitamin Water Executives and other key players discuss the brand, the new product and the in-store festivities. 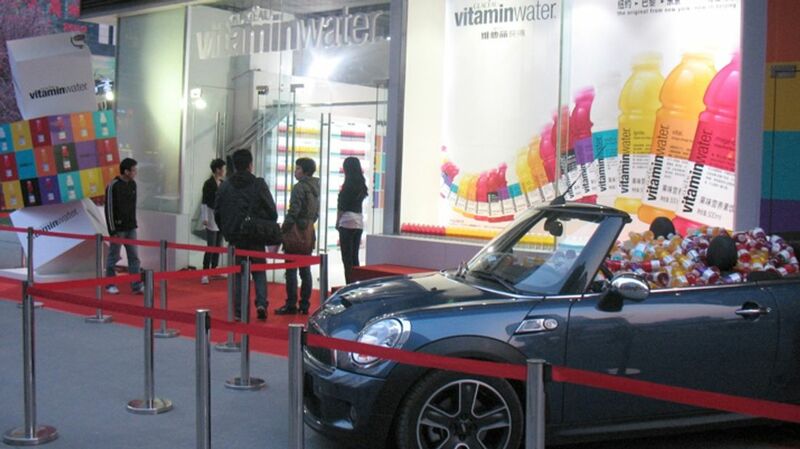 To drive traffic to the store, a Glaceau Vitamin Water webpage was designed and linked to various social media networks and online communities. Here, visitors could interact with fellow fans, learn more about the product and even watch the latest in-store activities. As a bonus, online users could download and print a coupon, redeemable for a sample drink in the store. Press, bloggers and other industry followers were on hand to cover the festivities. A multi-colored, checkerboard-like wall served as a vibrant backdrop to the cameras.